You know how it goes. An event occurs and time passes. The people involved are no longer around. The details of the event become hazy and faulty memories create new, false details about the how and why of the event. An archives is a wonderful resource for confirming the facts of an event and correcting the stories and myths that often grow up around a historic event. 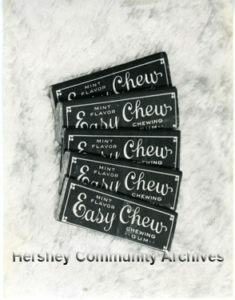 Here is a fact: Milton Hershey manufactured and marketed chewing gum from 1915 to 1924. We know this because of records found in the Hershey Community Archives. These records include financial statements, packaging samples, sales materials and oral histories with people directly involved with the manufacture of chewing gum. There are lots of questions about Hershey’s chewing gum. What was its name? What flavors of chewing gum did Hershey produce? Why did Milton Hershey want to manufacture chewing gum? Why did Hershey stop manufacturing chewing gum? Some of these questions are easily answered, with the help of the Archives’ collections. Manufacturing and sales files provide answers to the when and what of Hershey producing chewing gum. The ‘why’ and ‘how’ questions are more difficult. For example, one popular story told regarding why Milton Hershey decided to manufacture chewing gum includes an Atlantic crossing where Milton Hershey met William Wrigley, Jr. According to the story, the two men took an instant dislike to each other and Milton Hershey returned with a burning desire to best Wrigley. He first tried to do it by purchasing Philadelphia’s baseball team. When that plan didn’t work out, he decided to compete with Wrigley by manufacturing chewing gum. While this is a great story, a close examination of the story reveals some holes. Hershey’s chewing gum was introduced in 1915. Wrigley didn’t begin his ownership of the Chicago Cubs until 1916. Plus there is no documentation placing Wrigley and Hershey on the same cross-Atlantic ship. A more reliable source can be found in the Archives. In 1954 Clayton Snavely* was interviewed for a planned biography of Milton Hershey. Clayton Snavely began working for the Hershey Chocolate Company in 1911 as a salesman. In January 1915, he was called to a meeting with Milton Hershey. His oral history interview describes those initial meetings with Mr. Hershey and includes his memory of why Milton Hershey wanted to make chewing gum. According to Snavely, Milton Hershey’s venture into chewing gum was inspired by a number of factors. At the turn of the 20th century, chewing gum was growing in popularity following several developments in manufacturing equipment. Rather than wanting to best William Wrigley, Jr., Clayton Snavely related in his interview that Milton Hershey wanted to respond to the Beech Nut Company’s efforts to market chocolate and cocoa. This was in January . As I previously mention, I spent a week-end with Mr. and Mrs. Hershey at the Dennis Hotel, Atlantic City [New Jersey]. And after breakfast Sunday morning, Mr. Hershey and I were walking down the boardwalk, and Wrigley, the chewing-gum people, had a large advertisement on the boardwalk of their product. From this interview, it’s easy to understand how Wrigley got mixed up in the story, particularly, since Wrigley may be a better known brand. To learn more about Hershey’s venture into chewing gum, click here. *Clayton Snavely was a son of Frank Snavely (Milton Hershey’s mother’s nephew and Milton Hershey’s 1st cousin).